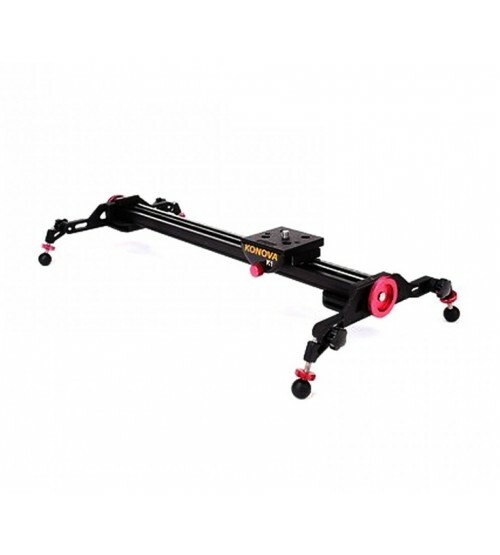 The 39.4" long Konova K5 Slider supports loads up to 50.7 lb and features roller bearings that provide smooth, stable, and quiet operation. Compared to the K2 and K3 sliders, the K5 Slider features larger bearings and larger 8mm chrome-plated rails, contributing to its increased load capacity while maintaining smooth slides. The slider can be supported using a single tripod or a pair of tripods/stands thanks to 1/4"-20 threads located on the underside of the track, positioned along the center and at either end. Additionally, there are threaded holes on the sides of the slider that enable you to mount it vertically. For ground-level shooting, a pair of height and angle-adjustable legs with rubber ball feet are included that screw into the sides of the slider.